Keep your gear safe with this retractable cable lock. The 15' braided steel cable threads through your gear and locks with the included padlock. Nylon case is durable. Attaches to driver's-side stake pocket closest to your cab. Lowest Prices for the best vehicle locks from Lippert Components. 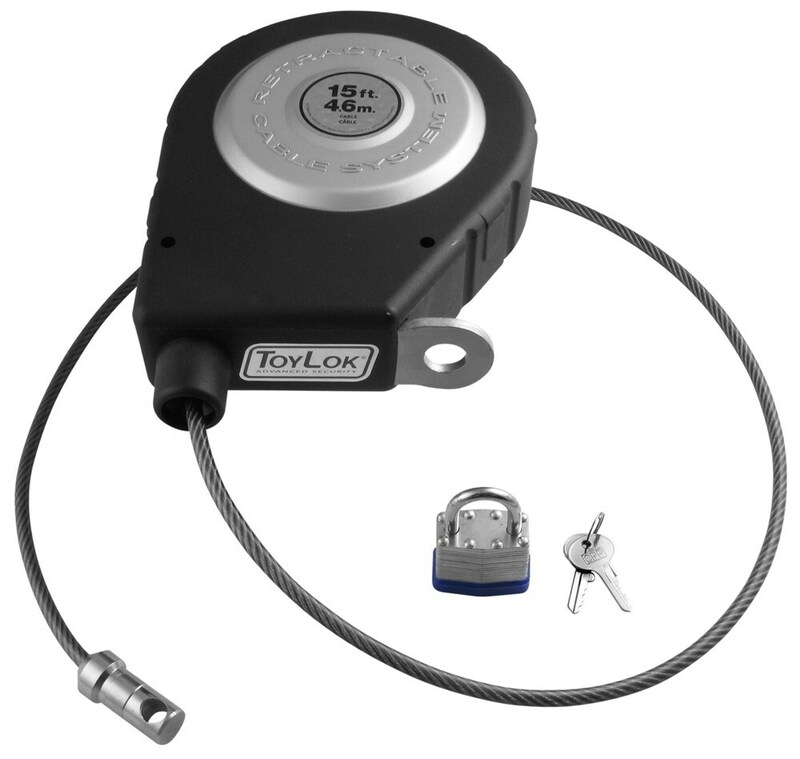 ToyLok Stake Pocket Mounted Retractable Cable Lock - 15' Cable - Nylon Case part number LC337120-337112 can be ordered online at etrailer.com or call 800-298-8924 for expert service. Keep your gear safe with this retractable cable lock. The 15' braided steel cable threads through your gear and locks with the included padlock. Nylon case is durable. Attaches to driver's-side stake pocket closest to your cab. 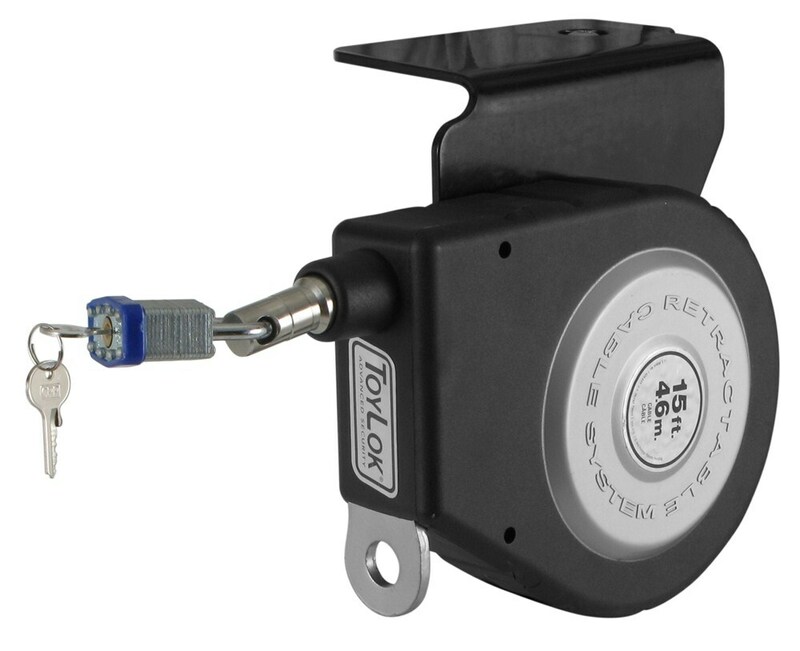 Whether you're headed to the campsite or the jobsite, this stake-pocket-mounted ToyLok keeps bikes, lawn chairs, fire pits, generators, power tools, small ATVs or UTVs, and more safely locked in the bed of your truck. 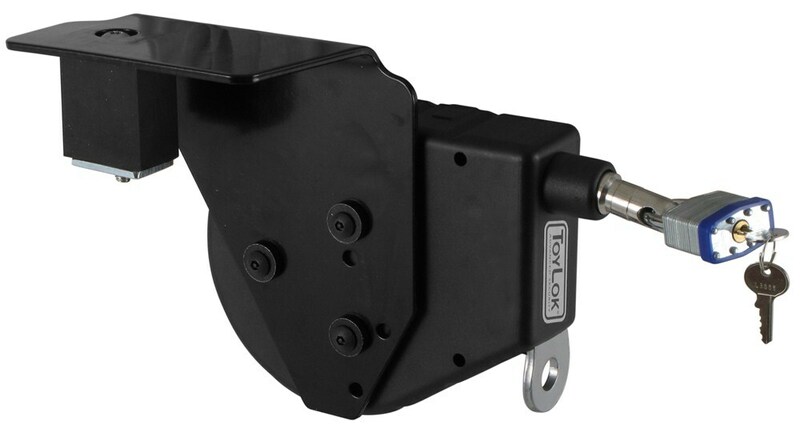 Simply bolt the ToyLok to the mounting bracket with the included hardware and place the bracket inside your truck bed stake pocket. 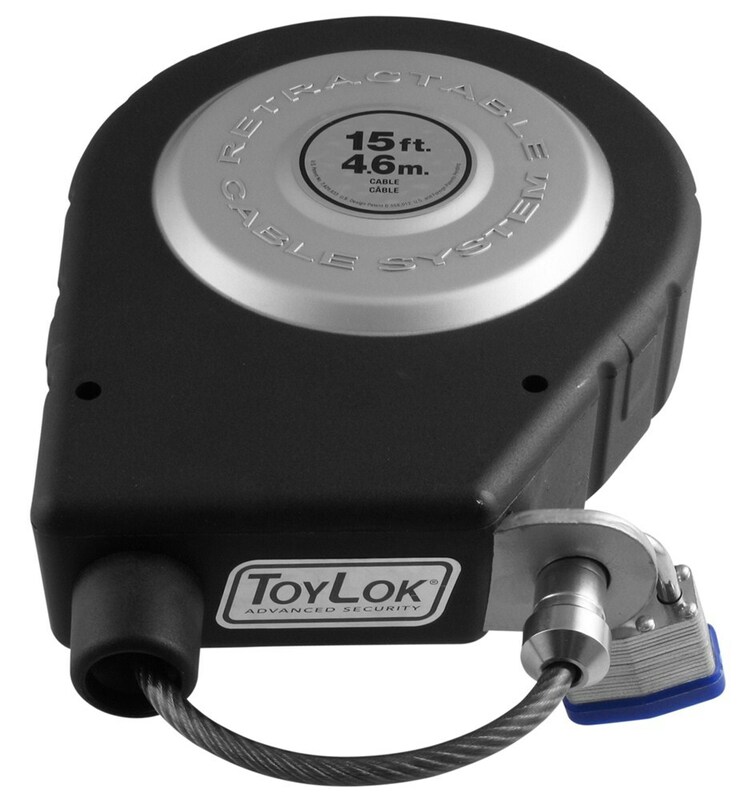 The ToyLok's 15', retractable cable is made of braided steel, which is virtually impossible for bolt cutters to cut through. 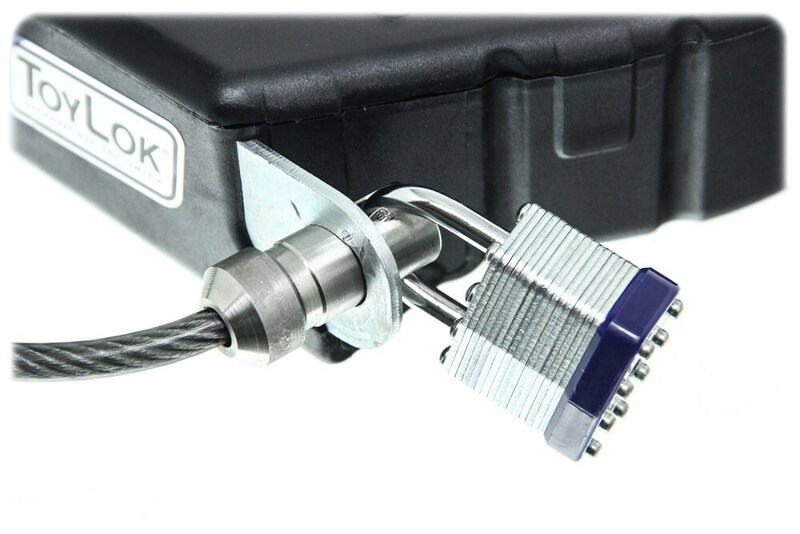 The PVC coating on the cable protects gear from scratches, and the stainless steel retention knob lets you connect the cable to the included padlock. To use the ToyLok, simply pull the cable out of the nylon housing and thread it through any open spaces in your gear, such as wheels or handles. The built-in clutch lets the cable extend and retract smoothly without snapping. The clutch also lets you pull out only the length of cable that you need to secure your gear, so there won't be extra cable in your way. The ToyLok cable can be locked 2 different ways. The first is to thread the retention knob through the receptacle on the side of the ToyLok, and then secure it with the included padlock. The second is to secure the cable to itself using the padlock. To do this, insert the padlock through the hole in the retention knob and then lock it around the cable. 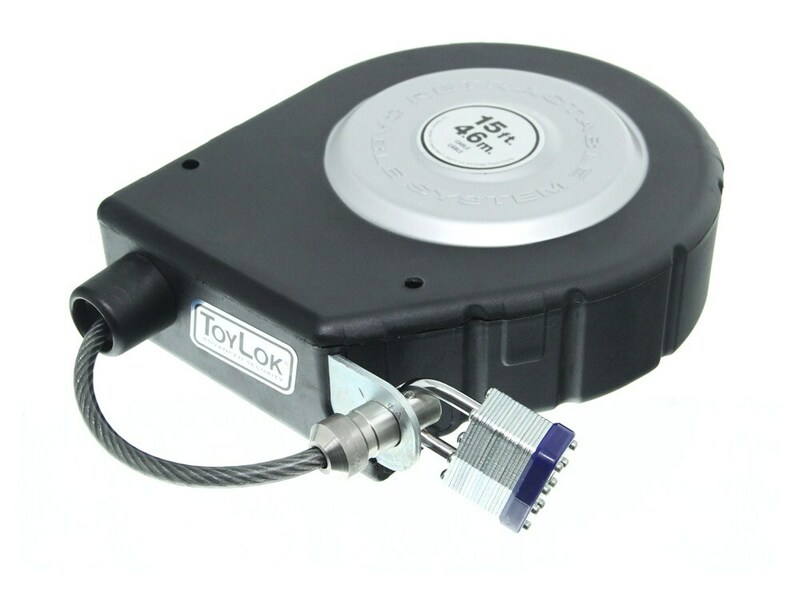 To assemble the ToyLok, bolt the nylon casing to the bracket with the included hardware. There are pre-drilled holes on the bottom of the case for this purpose. Two different mounting blocks are included to provide you with the perfect fit for your truck bed stake pocket. Mounting option 1 is for installations in stake pockets that have enough clearance to fit the 3-1/2" long x 1-1/4" wide mounting block. Mounting option 2 is for stake pockets that are a bit smaller and can only receive the 2-7/8" x 1-1/4" wide mounting block. Both mounting options use a 3/8" bolt (included) to secure the bracket to the truck. 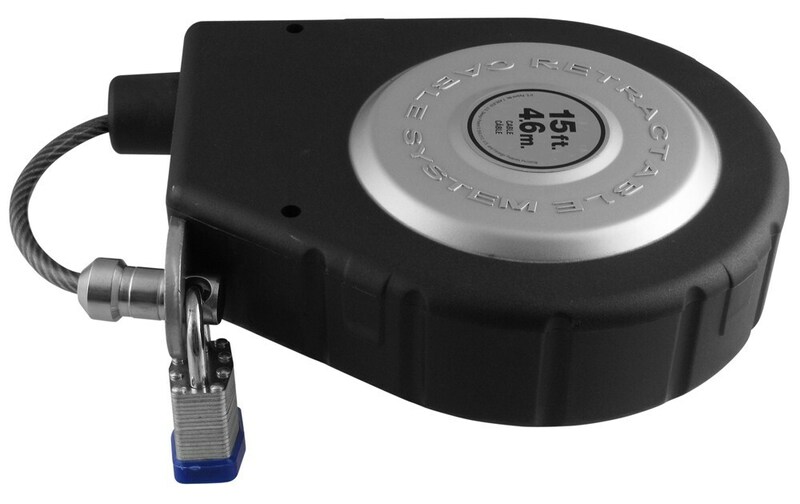 Prevent roll-away theft with this 3" disc brake lock. The lock attaches to your bike's disc brake and a bright orange cord attaches to your handlebars to remind you to remove lock before riding. Includes 3 keys and handy storage case. Keep your gear safe with this retractable cable lock. 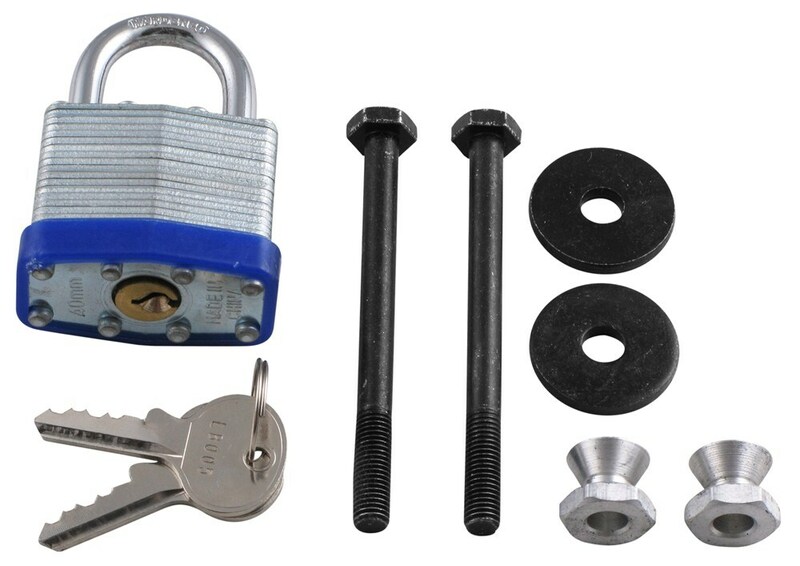 The 15' braided steel cable threads through gear and locks with the included padlock. 1-5/8" Hole saw lets you drill a hole in your toolbox for the cable to run through. Keep your gear safe with this retractable cable lock. 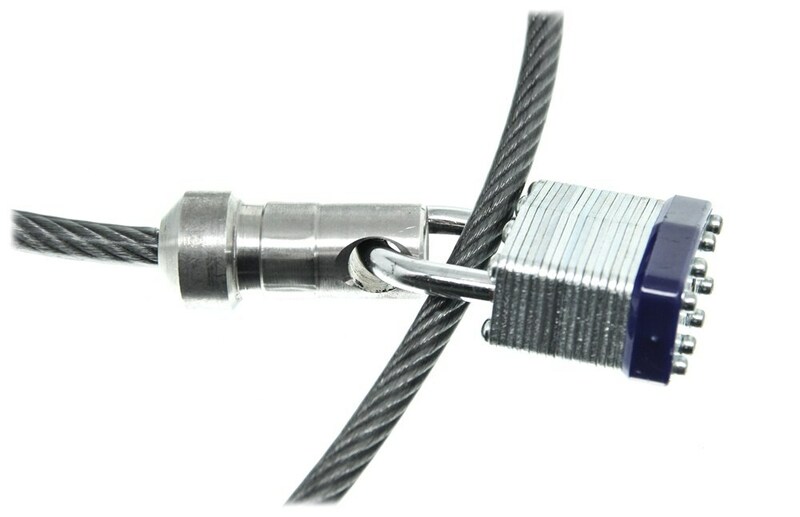 The 18' braided steel cable threads through gear and locks with a padlock (sold separately). 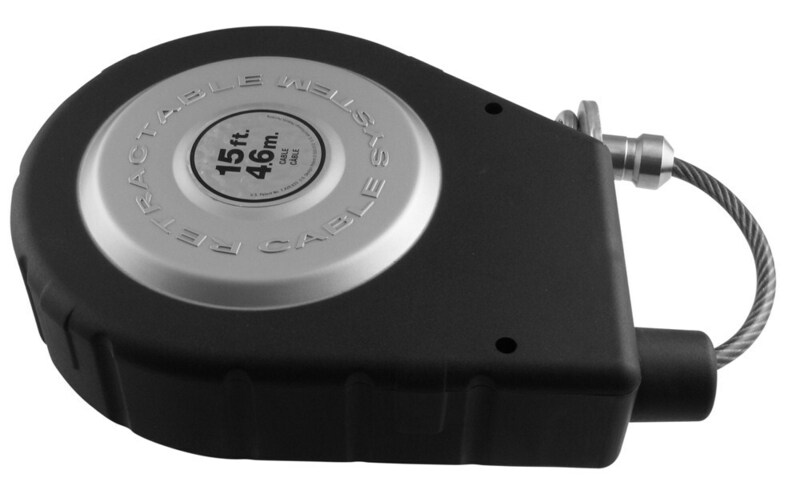 1-5/8" Hole saw lets you drill a hole in your toolbox for the cable to run through. Today we're going to review part number LC337120-337112. 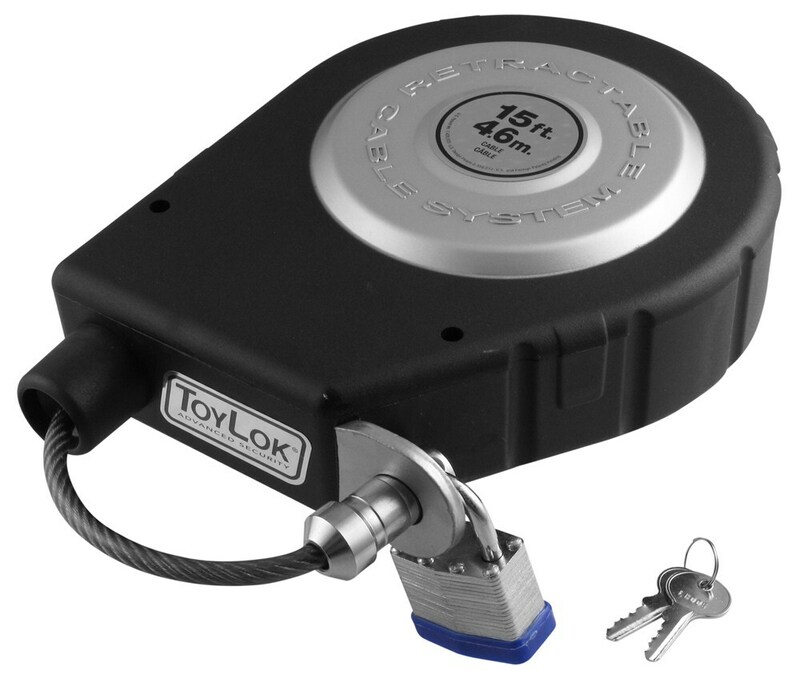 This is the Lippert ToyLok Stake Pocket Mounted Retractable Cable Lock. It has 15 feet of cable in it. This stake pocket mounted cable and padlock system secures gear to help prevent theft. 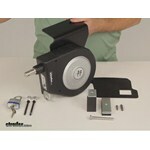 It's ideal for securing generators, motorcycles, bikes, chairs, power tools, ATVs, and many other items. The cable's all on this nylon case that won't dent, scratch or rust. 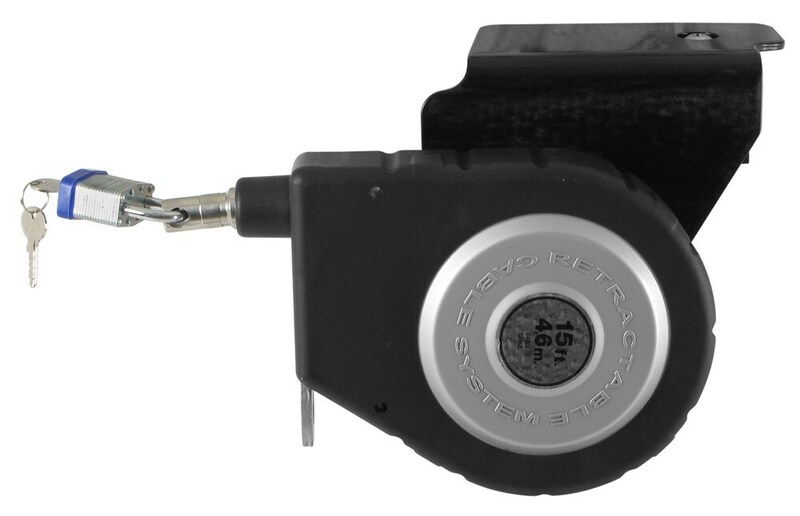 The retractable cable itself will thread through the items you want to secure and then bring it back down to lock it into place. It's made of a braided steel construction which is largely impossible to cut through. It has a nice PVC coating on it to reduce abrasion and rub marks. You don't want to damage any of the items you're trying to secure. Inside here it has a nice, smooth-acting clutch for easy cable operation. It'll let you pull out the length of cable that you need and it'll prevent cable snap back while retracting. Basically, once this is installed in your stake bed, you can pull out the cable that you need. Basically, what will happen is when you pull it out, when you start hearing the clicking noise, that's when you can let it go and it'll stay out in that length you pull out. Let's pull this out. Now when it's clicking we let it go and you can see that you got this much length out. If you want more, you can just pull it out some more. If you need to retract it, just pull it out until it stops clicking like that, and then just let it go and it'll retract back in to the case. Now, there is two locking options. Using this included padlock, basically what you can do is pull this out and then run it through your items you want to secure, bring it back down through here, and then just run your padlock right through there, then lock it into place. You have everything locked in. The other way would be just to run the cable. Run this back to the cable itself. Let me set this down here. If you just run this back to the cable, run the padlock through there, and then around the cable. You can lock in position just like that. You can lock is that way also. Either way would work fine. This is an easy no-drill installation. It is designed for installation in the driver side stake pocket closest to the cab. The two mounting options, as you notice here, these are the hardware that comes with the bracket itself. You can see the bracket I've already installed to the ToyLok and there are two mounting options. That's why they have the two different blocks here. Basically, it just depends on the size of your stake bed pocket in your truck. These two would give you the option of giving you a perfect fit in your stake pocket of your truck. The rubber pad right here underneath fits under the mounting bracket, protects the bed rail. We also have this rubber pad here that has an adhesive backing that you peel off and you can put that on here when you go to put this on. You can put it on just like before you. They'll also protect the finish of your truck bed when you mount this to it. Now the application again is most full sized pick-up trucks stake pockets. The cable length on this is 15 feet. The cable break strength is 8,000 pounds and it does come with everything shown here. This is the hardware to install it into the stake pocket. This hardware comes with the ToyLok. If this ToyLok wasn't mounted on the stake pocket, you could use these mounting bolts to attach it to wherever you want it to. It all comes with theft-resistance hardware. Basically, what's nice about that is when you mount this on somewhere else besides the stake pocket and use this hardware, you can tighten this down. Once you tighten it down enough, it'll break that nut off and just leave the cone-shaped nut and once that's tightened down, they can't unscrew it to remove this from wherever you have it mounted to steal your items. Also, the bolts that are used to attach the ToyLok to the bracket are also theft-resistant. It looks like an Allen bolt, but there's a pin in the middle, so you do have to use this special driver to tighten those down. Again, somebody can't just loosen those with a regular Allen wrench. They need a driver like that. Same way on the stake pocket. When you install the stake pocket, this would go in the stake bed like that and then you drop the bolt through here, and then just screw it through the rubber on to the bracket. When it tightens down, it would squeeze that rubber to hold it into the stake pocket. That bolt also uses a special driver that just needed. They can't just unbolt that to remove it. Anywhere it's attached, it does have a theft-resistance hardware attaching it to the vehicle. 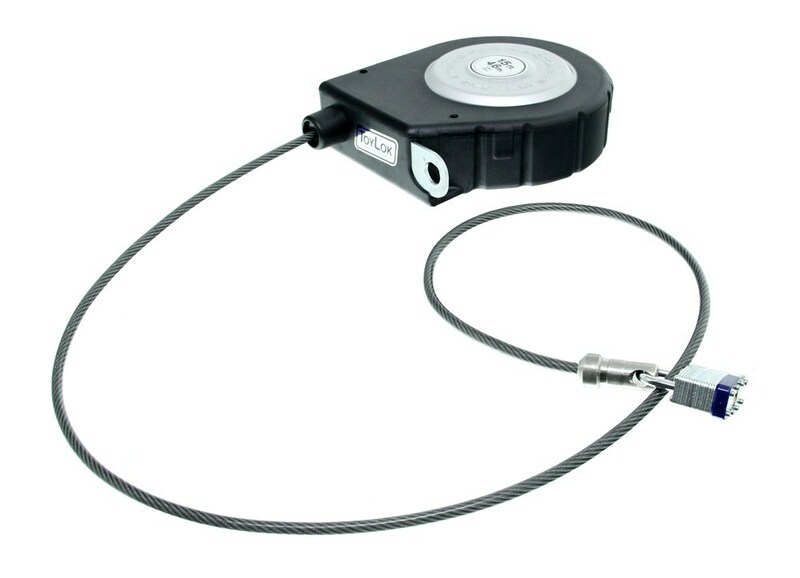 That should do it for the review on part number LC337120-337112, the Lippert ToyLok Stake Pocket Mounted Retractable Cable Lock with a 15 foot cable.	.
Order: RelevanceNewestRating - High to LowRating - Low to High Keep your gear safe with this retractable cable lock. The 15' braided steel cable threads through your gear and locks with the included padlock. Nylon case is durable. Attaches to driver's-side stake pocket closest to your cab. It depends on where you have your Truxedo tonneau cover rails clamped to on the bed of your 1967 Chevy C-10. Really you can mount the ToyLok, # LC337120-337112, just about anywhere you are comfortable bolting it to. Bascially, if the clamps and other parts of the tonneau cover are clear of the stake pockets you could mount it in that location.